I have always been the person with perfect skin. Always. Until recently. Then suddenly about 2 years ago when we were in Greece that summer, I noticed on my neck there was a weird red, burning rash that didn't go away. I went to the dermatologist and he said it was from the sun, gave me an ointment and it went away temporarily. Then it started to come back again. And it got progressively worse over the years. Finally it became a scaly patch on my neck that was very large, dry, red and irritated. I knew immediately what it was. Eczema. And I knew it was eczema because my daughter has eczema. So I went to the dermatologist again and he said you have eczema (atopic dermatitis), just put some over the counter cream on it and it will go away. ??????? I was flabbergasted. That's it? Stunned, I luckily already had this cream from Kamedis to test out and review because I had specifically asked for this as I knew I had eczema and I wanted to treat it. So I started using the Kamedis CALM Eczema Therapy Cream on my neck twice a day. Within a week the scaly patch was gone. Seriously. Gone. I was completely shocked at how fast it got rid of the eczema. 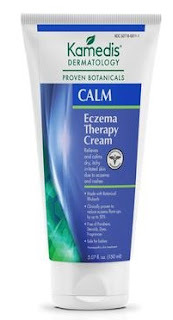 The Kamedis CALM Eczema Therapy Cream is very good for dryness, irritation, redness and scaliness. It is an herbal remedy cream that is made with botanicals and has been clinically proven to reduce eczema flare-ups by up to 50%. This product nourishes and calms for long term relief. It is made with botanical rhubarb, great burnet, tree of heaven, baikal skullcap, cnidium fruit and licorice. The cream is free of steroids, parabens, dyes and fragrances. Kamedis formulations are derived from plants and result from years of scientific studies and clinical trials. After combining the right botanicals for your skin with careful sourcing, extraction and purification, they bring the creams to the market. The naturally vivid greens, ambers, sapphire and honey colors of their formulations are proof of how concentrated and pure their botanicals really are. The active ingredient in this cream is Sulphur 12X HPUS (The letters HPUS indicate that the components in the product are in the officially recognized Homeopathic Pharmacopoeia of the United States). For best results use with Kamedis Eczema Therapy Wash and Kamedis Calming Lotion. I find this product to be EXTREMELY satisfactory. I am very happy with how it performs. It literally took my scaly, dry, irritated skin and what is left is nothing but smooth, beautiful neck skin. I cannot show you photographs because the eczema didn't really show up in photos, it was too light to be seen. As it was just some scaliness on my neck and looked like extra-dry skin. But now my neck is nice and smooth again. I am very, very happy and highly recommend this product if you have eczema. It doesn't burn or sting going on. The only recommendation they make is to make sure and keep it out of your eyes. Other than that it can be used anywhere on the body. Since this cream worked so well for me I'm going to keep buying it. The tube is huge and will last a few months. Now that the eczema is gone I only have to figure out my maintenance routine. I figure that is once a day. So at night I put a little bit of cream on my neck. The huge tube is only $20.99 which is not bad for something so beneficial. There are plenty of other treatments on the market and they are less expensive but who knows if they work. This worked. And works. I mean I would give it a 100% chance for me. On their website they have very informative links to sites that discuss eczema and how to treat it, blogs that discuss it and other tidbits of information about eczema/atopic dermatitis. Kamedis Dermatology Products are available online through www.kamedis-usa.com. Like Kamedis Dermatology on Facebook: https://www.facebook.com/KamedisUSA; Follow Kamedis Dermatology on Twitter: @KamedisUSA; Follow Kamedis Dermatology on Pinterest: https://www.pinterest.com/kamedis/; Follow Kamedis Dermatology on Instagram: https://www.instagram.com/kamedis_skin_care/ and Subscribe to Kamedis Dermatology on YouTube:https://www.youtube.com/channel/UCH_1rheAana8aNH7-Xbtnbw.